Healthy, Happy Families Look Like This! It’s taken a while, but the media is finally including the 25 percent of the American population that have a disability. With the recent popular television shows that depict disability in every day life, or hire actors with real disabilities, we are moving to a more inclusive and accurate depiction of American life. 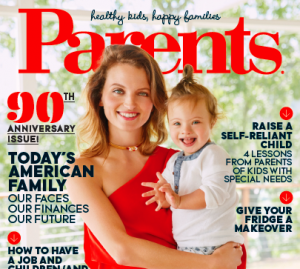 Parents magazine is one of the recent publication to be inclusive. Gracing the cover of the September 2016 issue is Amanda Booth and her son, Micah, age 2. A real-life model, this mom is beautiful. So is Micah, as children on magazine covers tend to be. Micah has Down syndrome, which is not necessarily important to mention except he is on a magazine cover! A child with Down syndrome on the cover of a national magazine is a rarity. You can count on one hand how many times this has happened: The now defunct BabyTalk had two covers featuring babies with DS, one in 2001 and one in 2007. Sarah Palin and her son, Trig, appeared on People in 2008. Recently, a Georgia mom, Megan Nash, submitted photos of her son to an advertising agency working on a campaign for children’s clothing company OskKosh B’gosh. She was told the agency wouldn’t submit her son’s photos because OshKosh didn’t specify they were looking for a baby with special needs. Nash didn’t want special treatment, she just wanted the same opportunities for her son as other parents have. You would think that given how far we’ve come to understanding disability, we would see children with a disability represented in the media about 25% of the time. Sadly, it isn’t. Clearly we still have a long way to go in terms of inclusion. Organizations like Changing The Face of Beauty are committed to promoting equal representation of people with disabilities in advertising and media worldwide. They have worked with companies to change their policies, produced photo shoots of kids with disabilities, partnered on a clothing line and helped put the first woman model with Down syndrome on the runway at New York fashion week 2015. Television has been taking note too. With the successful seasons of several series that employ/present people with disabilities in an honest light. The groundbreaking 1989 series “Life Goes On” was the first television series to have a major character with Down syndrome “Corky”, played by Chris Burke, who himself has Down syndrome in real life. Currently, ABC airs a show about a child who has special needs. The 30 minute series “Speechless” features a character, JJ, played by Micah Fowler, an actor who has cerebral palsy in real life and previously appeared in the 2013 film “Labor Day”. A heart-warming, empowering story of a family whose mother will do anything for her husband and kids. A&E has renewed “Born This Way” for a second season. The show, which debuted last December, follows seven young adults with Down syndrome and their families in Southern California. So, we are slowly working toward inclusion. Oh, and that Georgia mom’s son? OshKosh has reached out and scheduled a meeting with them!